Dr. Muhammad Zaeem-ul-Haq Bhatti is a Pakistani Mathematician and HEC Approved Supervisor, specialized in Geometry, Relativistic Astrophysics and cosmology. He started his career by joining University of the Punjab, Lahore as a Lecturer in 2014. Currently, he is serving as an Assistant Professor in Department of Mathematics, PU after completing his PhD in 2015. According to the Directory of PSP 2017 released in 2018, “Pakistan Council of Science and Technology” has announced Dr. Zaeem as the thirteenth most productive young scientist of Pakistan (https://www.pcst.org.pk/docs/PSP2017.pdf ). He has been working as the Coordinator of M.Sc. Program at Department of Mathematics, University of the Punjab since 2016. 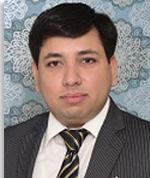 He has attended and presented research papers in many National and International Conferences and member of different societies and groups like Pakistan Physical Society and The Group of Gravitation and Cosmology (http://www.pu.edu.pk/ggc/). He has published more than 60 research papers in various well-reputed Impact Factor International Journals like Journal of Cosmology and Astroparticle Physics, Classical and Quantum Gravity, Physical Review D, Annals of Physics, Monthly Notices of the Royal Astronomical Society, Physics of the Dark Universe, The European Physical Journal C, The European Physical Journal Plus, Astroparticle Physics, Astrophysics and Space Science, General Relativity and Gravitation, Physics Letters A, International Journal of Modern Physics D, The European Physical Journal A etc. which have been cited more than 1100 times by various National and International Researchers. The cumulative impact factor of his research articles is about 160, according to the 2017 Journal Citation Reports released by Thomson Reuters in 2018. He is a reviewer of various impact factor international journals and working on editorial board of some international journals as well. He has been selected in Category A for Research Productivity Award in 2015 by “Pakistan Council of Science and Technology” and has been regularly awarding with Research Incentives from University of the Punjab and Research Productivity Awards by PCST. Due to his significant research, his name is among the top young researchers of Pakistan in the field of Mathematics. Dr. Zaeem is also involved in supervising M.Phil./Ph.D. students in the field of relativity, astrophysics and cosmology. Dr. Zaeem has also been involved in organizing various seminars as well as National and International Conferences on Gravitation and Cosmology in University of the Punjab. Initially, Dr. Zaeem has worked on the inhomogeneous matter distribution in the Universe due to different fields, in particular, electromagnetic field. He also studied the dynamical instability issue and cavity formation in the cosmos with self-gravitating objects. Currently, he is investigating the alternatives to black holes and their stability problem in the background of gravitational theories.